Coalition Advocacy | Stop Asian Carp! Read the Coalition’s Letter here. Read the Coalition’s Press Statement here. View the Stop Invasive Carp Poster here. The Stop Carp Coalition released today the results of a statewide poll conducted in June that show Minnesotans are concerned about the threat of Asian carp to our waters and want action taken. 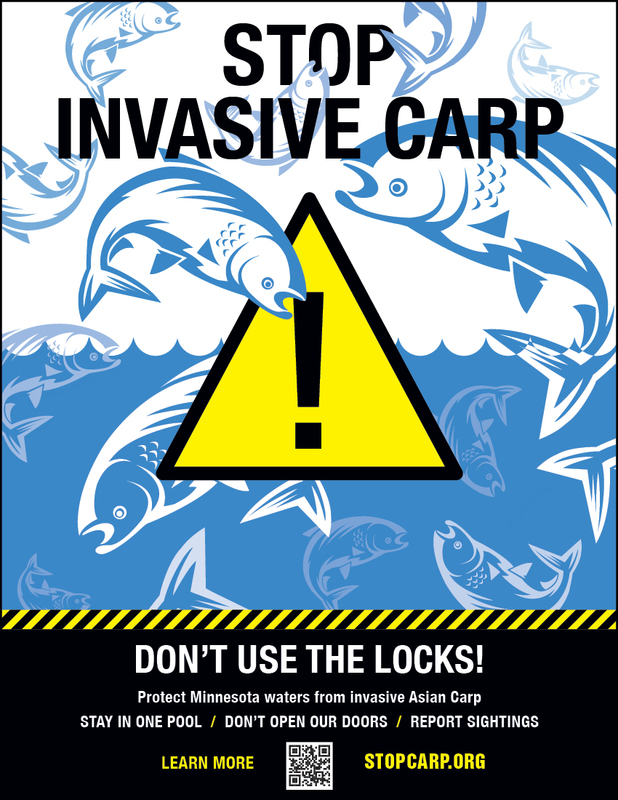 63% support closing locks in Minneapolis to stop the invasive fish. Please see the Coalition press release here and the poll analysis here. The poll was funded by the McKnight Foundation. Given the severe public threat posed to Minnesota’s waterways and lakes, the McKnight Foundation’s board has approved special support for this unique effort which lies outside the foundation’s formal grant strategies. Read the Coalition’s Press Statement in response to Senator Klobuchar’s successful amendment on the closure of the Upper St. Anthony Falls Lock. Read the Coalition’s Press Statement in response to the latest eDNA results here. On February 24th, the Stop Carp Coalition called state officials to prioritize a few urgent actions to stop the progressing threat of Asian carp. First, we must take steps toward the closure of locks at two key dams – specifically the Ford Dam and St. Anthony Falls. Those closures would offer a total barrier against carp continuing upstream on the Mississippi and into a wide swath of other Minnesota lakes and rivers. Second, on waterways where no dam can provide a total barrier, deterrent technologies should be employed to slow the spread of carp. > Read the coalition’s letter to legislative leaders here! …and Congress must pass the Upper Mississippi CARP Act! The Coalition’s February 14th letter to Congressional sponsors of the Upper Mississippi CARP Act underscored the Coalition’s broad support for this effort, and the urgent need to close locks at the Ford Dam (Lock & Dam #1) and at St. Anthony Falls. > Read the coalition’s letter to the bills sponsors here!